We almost overlooked the Hey Hey Chinese Takeaway & Noodle Bar during a recent visit to Deal (a small seaside town in Kent). About to head home after a long day in the sunshine, we decided to stay put and have dinner somewhere locally. We scouted the streets looking for inspiration and came upon this small ‘hole-in–the-wall’ noodle bar / Chinese restaurant with a few seats for eat-in customers, and clearly a thriving takeaway business. What struck us was the extensive Asian-inspired menu that includes all of our favourite classic Chinese dishes (Cantonese, Peking, and Szechuan) along with several American-Chinese dishes, one of our favourites being the Mongolian Beef! 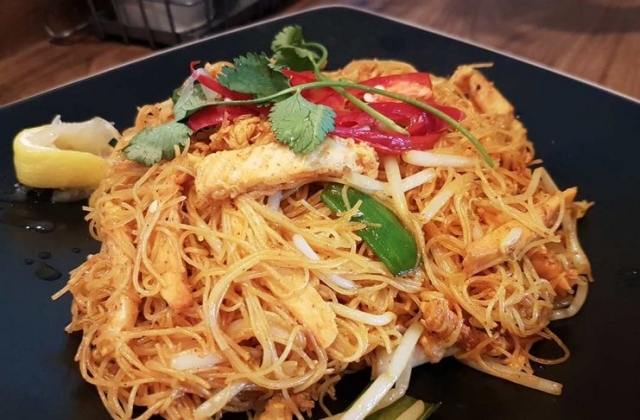 The menu has a selection of other Oriental dishes that include Thai and Malaysian classics such as red curry, Tom Yum, and Nasi Goreng. We’ll certainly review these at a later date. 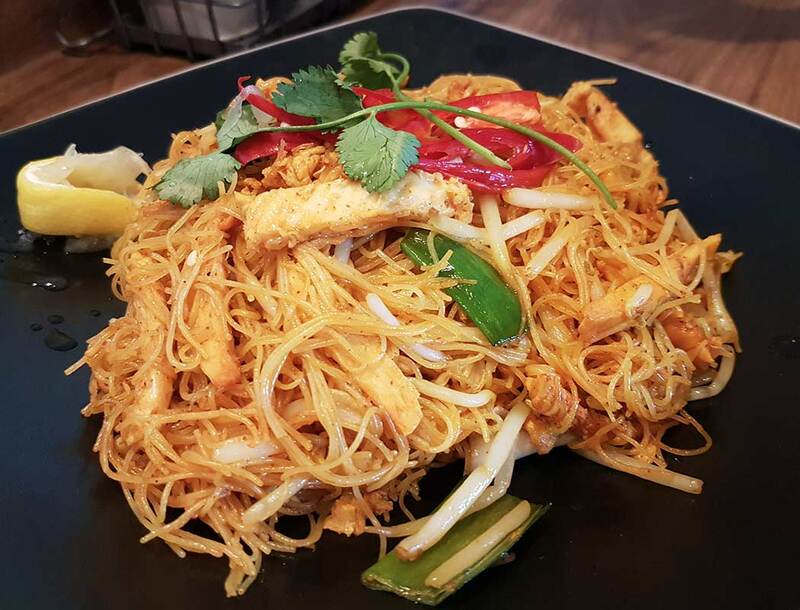 The Hey Hey Asian Kitchen Noodle Bar is more of a takeaway than a restaurant. Be aware that there are only a few seats (or rather stools), and that the vibe is more of a casual passer-by dropping in for their ‘noodle-fix’, rather than a fancy night out. However, if you are on your own or out as a couple for a little casual dining, then the Hey Hey Kitchen is perfect. What did we eat at Hey Hey Noodle Bar? Seriously, we were stuck for choice (in a good way), there are so many delicious sounding dishes that neither my partner or myself could make our minds up. Eventually, we decided upon appetisers and two main courses. 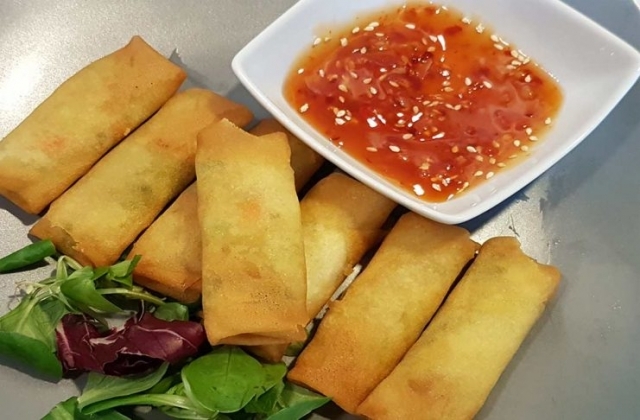 When it comes to Chinese food, we try not to be creatures of habit and attempt (every now and then) to give the taste-buds something a little different, however, when trying a new establishment or somewhere we have never eaten before, it’s back to basics, so we select the ‘old faithful’ spring rolls. In my opinion, the Chinese spring roll and how it is cooked says a lot about the restaurant. Get this dish right and you are off to a good start. The Hey Hey Noodle Bar got it right! Superbly light and crispy with enough vegetable to actually taste the flavour. 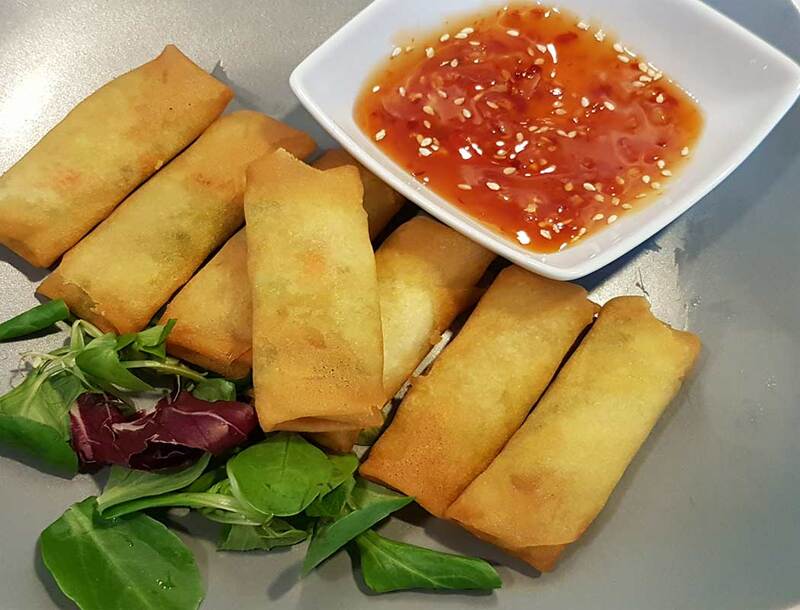 A fair portion of 8 spring rolls on a small bed of greens. The accompanying sweet chilli sauce made for the perfect dip. 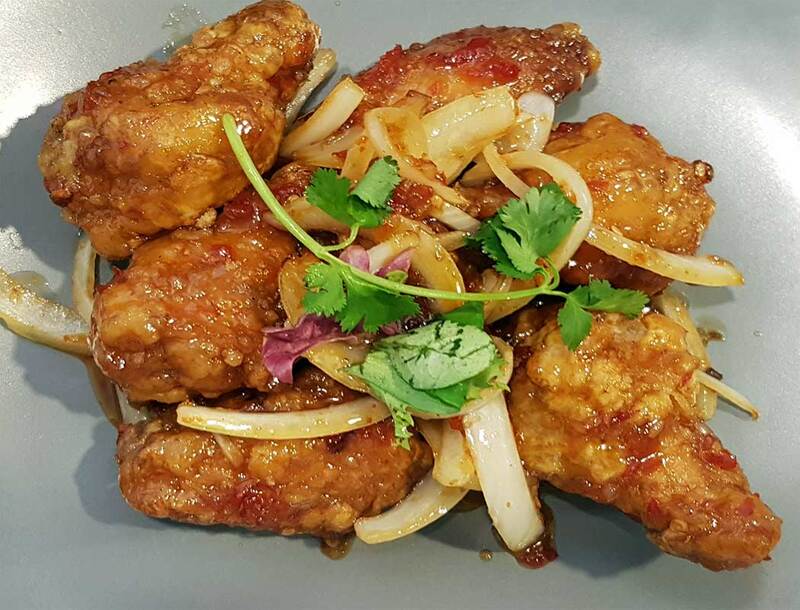 An additional appetiser, the Crispy Golden Wings with Chef’s Spicy Sweet Chilli Sauce comprised of 6 chicken wings that were almost too perfect!! 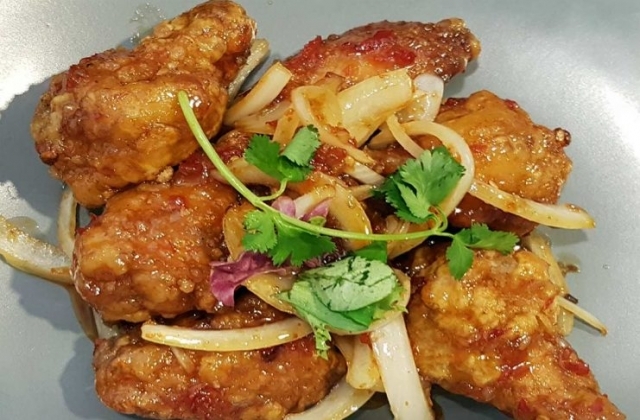 A crisp and glistening golden crust with sticky chilli sauce, all nestled on a bed of onions made these some of the better oriental chicken wings I have tasted from a takeaway. Both my partner and I raved at the taste and how succulent the chicken was. Clearly, somebody back in that Kitchen is taking real pride in their cooking – this is quite rare in Chinese takeaways as many play to our ignorance of what good western-style Chinese food should taste like, often substituting with sub-standard ingredients, and over-cooked sticky dishes. They sell in name only. This is where Hey Hey really excels however, it really does go the extra mile not just with the presentation, but with the entire taste experience. 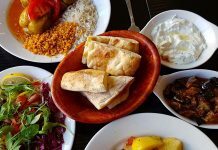 We were impressed, and that was just the starters! My partner ordered the Singapore Rice Noodles (Thin rice vermicelli) for her main course (a personal favourite) whilst I opted for something similar. Great presentation again here, a large dish of freshly cooked vermicelli, crunchy vegetables and succulent pieces of chicken scattered throughout the dish. 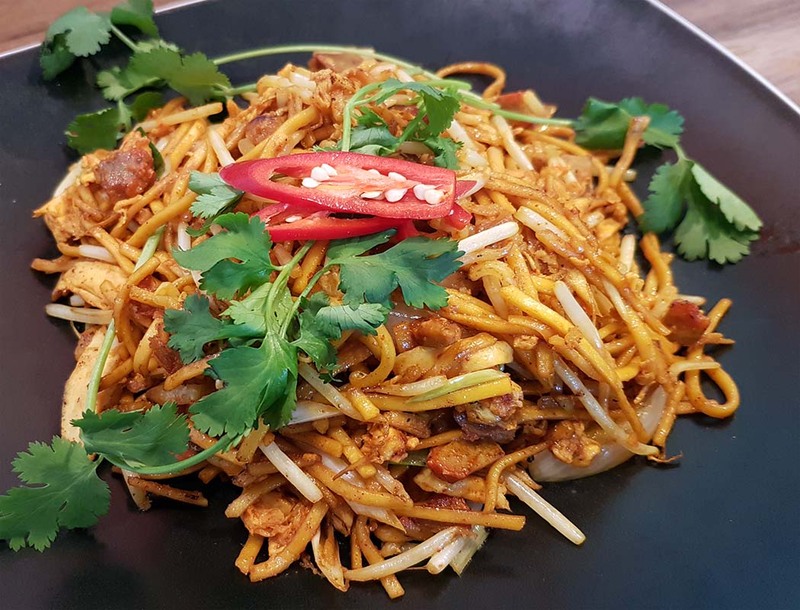 Another winner for these guys, this dish was excellent, though I would have preferred it a little more spice, more in line with how the standard Singapore noodle dish is. However, I am sure this can be requested, and my partner enthused about how she loved every last bite! I was torn between ordering the Singapore noodles, or the Mongolian Beef, that is when a photo of the Singapore Chow Mein caught my eye. 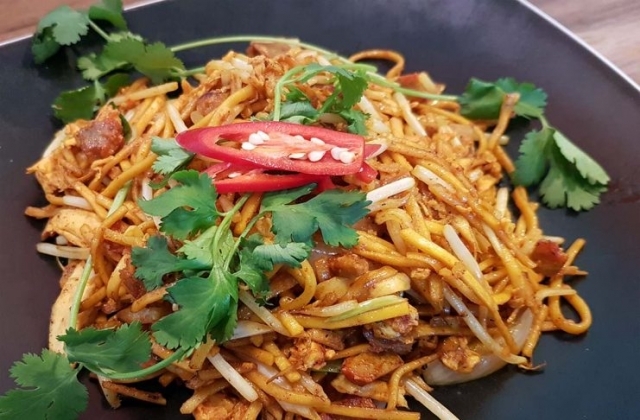 The reason for this ‘eye-catching’ dish is that it had a very similar look to the American-Chinese Lo Mein which incidentally has to be one of my favourite noodle style dishes. I simply had to order it, and glad that I did. This was a wonderful dish that I didn’t want to end. Full of flavour with juicy chicken and shrimp throughout. I ordered a side of chilli oil and enhanced the heat index a little. 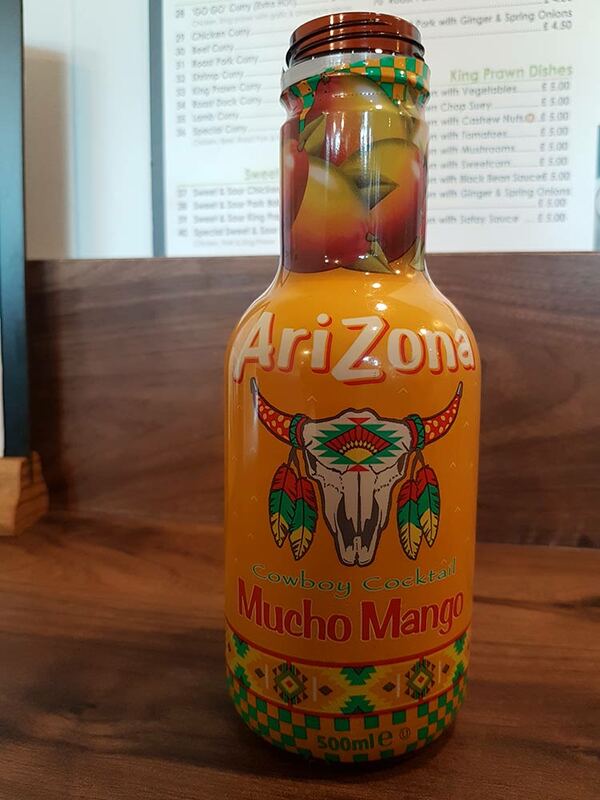 I had the feeling that it was probably created less spicy, likely due to customer feedback. I wouldn’t hesitate to eat this dish again and was pleased I did, while not quite the same as memory serves me, it did have that similarity to Lo Mein. Hey Hey in Deal serve a collection of soft drinks and one kind of beer, Tsing Tao, which my partner found quite refreshing with her Singapore noodles. 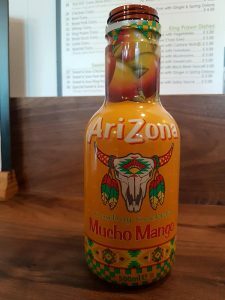 I opted for a soft drink – Arizona Mucho Mango (a cowboy cocktail) which went well with my spiced up Chow-Mein. Hey Hey Noodle Bar is moderately and competitively priced. Our bill, for example, came to £21.40 and included 2 appetisers, soft drink, 1 beer, and 2 main courses. It’s pretty much in keeping with the local area pricing, and do-able if you want to treat the family to a takeaway during the week. The Hey Hey Noodle Bar is a wonderful addition to the small but growing Deal dining scene. We can hardly wait to eat here again and will be coming back very soon – this time, to try their Dim Sum and their afternoon lunch Bento boxes. If you are thinking of eating here, keep in mind (as previously mentioned) there are only a few stools which are not so comfortable. However, the taste of the food soon makes up for that. 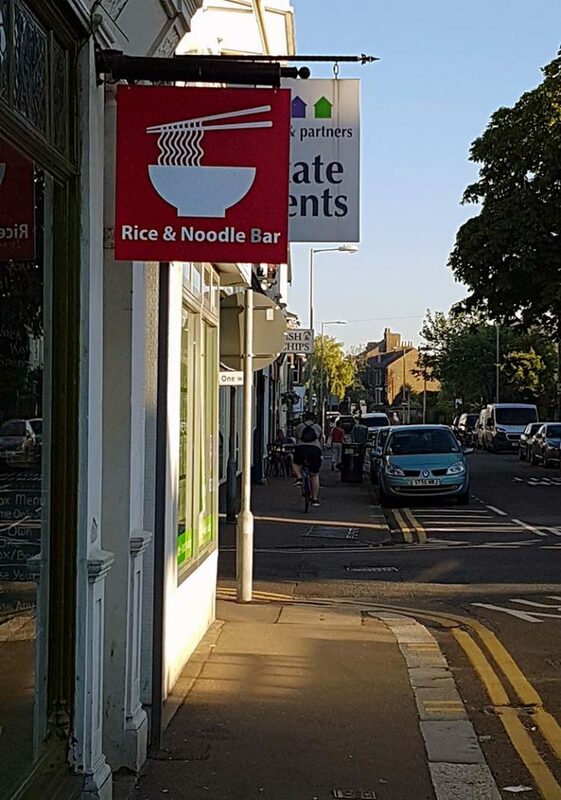 It is after-all a noodle ‘bar’, not ‘restaurant’! Hey Hey, is located in the heart of Deal, a simple and quick walk from the beach front will find you on Victoria Street, or simply follow the main shopping High Street until it meets Victoria. Looking at the date I see the review from July 2016. I can telly ou now that in this short space of time the takeaway has changed. They have a new cook which is nowhere near as good as the owner. The food taste weird, chicken wings have a strange flavour and the beef is grey looking. Everything about Hey Hey food is different. You can tell the difference between the styles of cooking of owner and the new cook. Please will you change the review to reflect this or at least go back there and try the food. Thanks for the reply on the post. I strongly suggest giving it another try. It may have been a temporary glitch, however, they seem to be back on it again.